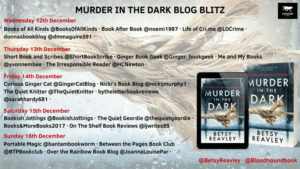 I’m so pleased to be able to share an extract from Murder in the Dark by Betsy Reavley today as part of the blog tour. It’s the follow up to Murder at the Book Club but can be read as a standalone. Both sound fabulous and perfect if you love books set in bookshops or book clubs. My thanks to Emma Welton from Bloodhound Books for the place on the tour. When Tilly Edgely lands a position working at Ashton’s bookshop in Cambridge she thinks she’s found her perfect job. But one winter’s morning, when she arrives to open up, she discovers the body of her boss suspended from the ceiling, hanging by a rope around his neck. 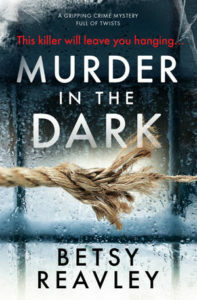 DCI Barrett and DI Palmer are called to the scene and quickly find themselves searching for a twisted killer whose identity and motive are nearly impossible to trace. Who is behind the killings and why? The police have their work cut out and key to unlocking the gruesome mystery might be found right under their nose. Matilda Edgely was doing her best to iron the creases out of her blue shirt, while keeping half an eye on the toaster, hoping that her breakfast wouldn’t burn. The cheap plastic clock on the wall of her basement flat ticked loudly, reminding her not to be late for work. Matilda, or Tilly as her friends knew her, had worked at Ashton’s Bookshop for six months. As a university student at Jesus College in Cambridge, she was working part-time to fund her education. Since she was very young, Tilly had known she wanted to become a vet and had worked extremely hard at school to achieve the results she needed to make it all the way from Devon to Cambridge University. Her parents, who were proud as punch, helped as best they could but were not in a financial situation to do very much. Tilly, who loved her mum and dad, was more than happy to knuckle down and do what needed to be done by herself. She had always been independent. Being born without a silver spoon in her mouth had taught her how to stand on her own two feet and fight for what she wanted. Frustrated that despite her best efforts the creases were not coming out of her cotton shirt, Tilly unplugged the iron and sat down to eat her Marmite on toast, while watching the breakfast news show. That December morning felt no different to any other. The only noticeable thing was the light covering of snow on the ground outside. Tilly groaned when she realised it would be better to walk to work than cycle, like she normally did, on her trusty old red Raleigh. Still in her dressing gown, Tilly picked up the still wrinkled shirt and took it into her small bedroom to get dressed. She shared the flat with one other student; a Chinese woman who was studying economics. They were friends but, in truth, Tilly found Yuki slightly irritating. Especially when she cooked Cantonese food that made the whole flat smell of shrimp paste. Yuki was also not so good at keeping the kitchen clean, and Tilly often found herself trying to scrub soy sauce marks off the kitchen surface. After dressing, Tilly tidied away her breakfast things before reaching for her coat, bobble hat and gloves. It looked cold outside and the walk from her flat on Maids Causeway to the bookshop on Trinity Street would take her fifteen minutes. She presumed Yuki was still asleep, since her door was shut, so Tilly closed the front door softly behind her. Then she set off to work, her breath leaving cloud trails as she walked briskly along the icy pavement, being careful not to slip. On that Friday morning, Cambridge was quiet. A number of schools had closed because of the snow. The weatherman had warned of more to come. It would be all most people could talk about. The British loved discussing the weather. Putting her headphones in, Tilly made her way along King Street towards the Market Square and listened to Florence and the Machine. She’d seen them play at Glastonbury once and had been an avid fan ever since. Sinking her gloved hands into the pockets of her duffle coat, she felt the keys with her fingers knowing that at the same time next week, she would be at home in Devon with her parents, preparing to celebrate Christmas. Although she liked Cambridge very much, it was a world away from Ilfracombe, the seaside town her family now lived in. She missed being by the sea and loved returning home. Tilly told herself that once she had become a vet, she would return to that part of the world and start a small practice of her own. It was the dream she’d had since she was eight years old and it had not lost its appeal over the last seventeen years. As she turned onto Trinity Street, she stopped for a moment to look at the wintery scene. Large flakes were falling from the sky and the university buildings on her left looked glorious in the snow. It was as if time had stood still. Tilly could imagine students throughout the ages walking those same cobbled stones, on their way to classes. The thought filled her with warmth. She liked the idea of a simpler era, before smart phones and the Internet. It was one of the reasons she loved Ilfracombe so much: it was untouched by time. Snapping out of her daydream Tilly hurried along the street to the shop, not wanting to be ticked off by her boss for being late. Although it was her job to open up the shop, she never arrived before Dennis, who was always sitting behind the counter when she got there, even if she was early. She turned on the light switch and saw the body of her employer hanging from a rope. But Tilly didn’t scream. She turned the lights off and turned and walked out of the shop. With a shaking hand, she pulled off one of her gloves, removed her phone from her bag, called 999, and asked to be put through to the police. 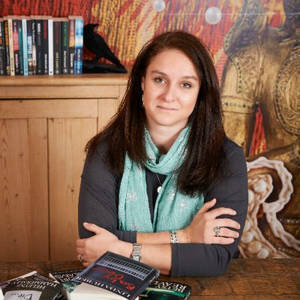 Author of The Quiet Ones, The Optician’s Wife, Murder at the Book Club, Frailty, Carrion, Beneath the Watery Moon and the poetry collection The Worm in the Bottle. Betsy was born in Hammersmith, London.